Ignatz takes the form of a cycle of love poems—in radical variations—based on Ignatz Mouse, the rodent anti-hero and love-object of George Herriman’s classic comic strip Krazy Kat. For decades, Krazy Kat rang the changes on a quirky theme of unrequited love: cat loves mouse; mouse hates cat; mouse hits cat with brick; cat mistakes brick for love; and so on, day after day. The backgrounds of the strip were in constant inexplicable flux: a desiccated specimen of Arizona flora morphs in the next panel into a crescent moon, then into a snowcapped butte, while the characters chatted obliviously on, caught up in their own obsessive round. Moving through pacy, overflowing sentences, enigmatic aphoristic observations, and pointed imagistic vignettes, Youn’s second collection vividly captures the way the world reorients around an object of desire: the certainty that your lover “will appear in the west, backlit by orange isinglass,” the ability to intuit a lover’s presence from the way “unseen flutes / keep whistling the curving phrases of your body.” Youn skillfully draws on the repeating narrative motifs and haunting landscapes of Krazy Kat as she tests and surpasses the limits of lyric to explore the cyclical elements of romanticized love. Youn speaks to and with her poetic forbears, whether St. John Perse, whose phrase “robed in the loveliest robe of the year” (T.S. Eliot’s translation) recurs in several love songs to Ignatz, or Geoffrey Hill, whose Mercian Hymns these poems recall in their serial structure and their commingling of the contemporary and classical. 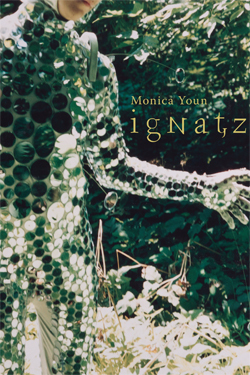 Ignatz is a poignant foray into the inventive possibilities of obsession and passion.